Decorate for the holidays or a theme while also adding flickering candlelight with one of our shaped/themed decorative candle holders! 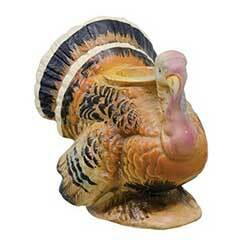 Thanksgiving, halloween, Christmas, country, primitive themes and more! Bat Mosaic Glass Tealight, by Tag. 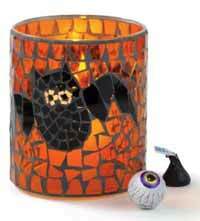 Handmade glass mosaic votive candle holder painted with a bat. Glass twinkles beautifully when lit with a candle! Measures 4.75 x 4 inches. Part of Tag's Halloween Collection. Intricately beaded, this silver beaded snowflake tealight is a unique accent for the holidays! Measures 6 inches. (candle not included). Mini Braided Pumpkin Tealight Holder, by Honey & Me. With their old-fashioned, rustic, handmade folk art charm, Honey & Me figures and accents add primitive charm to your country home! 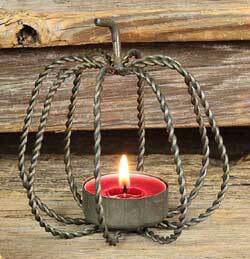 This is for the Small Braided Pumpkin Tealight Holder. Measures 4 x 4.75 inches. Made of twisted metal in a 3D shape, with a cup in the center to hold your standard-sized tealight candle (candle not included). Candy Corn Hand-Painted Glass Votive, by Our Backyard Studios in Mill Creek, WA. Rescued from the recycle bin, this glass votive candle holder has been repainted in one-of-a-kind folk art style. 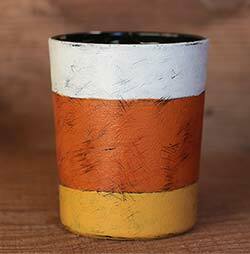 The candy corn striping of cream, pumpkin orange, and golden yellow have been antiqued and sanded back to reveal black underneath. Inside is unpainted. Measures approx 2 inches wide, and 2.5 inches tall. Finished with several coats of satin varnish. Paints and varnish are not flammable, but I would still highly recommend using with a battery LED candle, just to be safe! 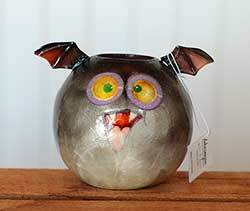 Capiz Ball Bat Tealight Candle Holder, by Dekorasyon Gifts. Made of molded and dyed capiz shell. Measures 4 inches. 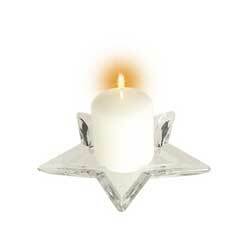 Fits a standard-sized tealight candle (not included). 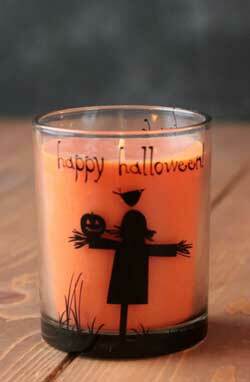 Halloween Filled Glass Candle, by Tag. Glass candle cup decorated with a spooky sweet halloween silhouette - comes already filled with an orange candle in spiced pumpkin scent! 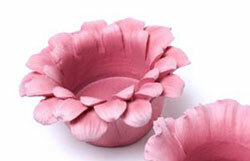 When the candle is burnt down, you can reuse the decorated candle cup! Detail photos show each side of the candle - it has a Scarecrow and Happy Halloween on one side, and Jack o'Lanterns with Trick or Treat on the other. Measures 3.75 x 3 inches. Burn time: 35 hours. 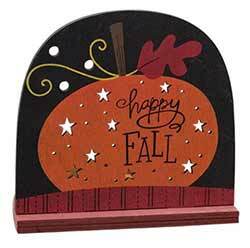 This primitive fall candle holder features a painted primitive pumpkin design that reads "happy fall." 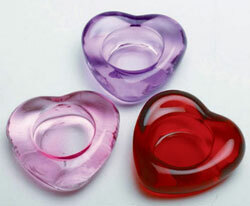 Heart Shaped Glass Tealight, by Tag. Sold individually - Choose the Pink, Lavender, or Red glass tealight candle holder. Measures 1 x 3.1 x 3.1 inches. Priced per candle holder. Holiday House Tealight, by Tag. 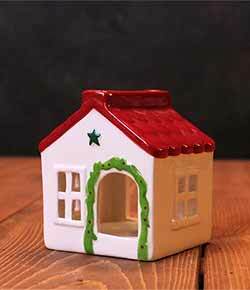 Darling ceramic house, with air vent in back so that it can hold a tealight! This is for the shorter house, which as a red roof. Part of the Hope Peace & Joy Collection. Measures 3.625 x 3.188 x 3.188 inches. Holiday House Tealight, by Tag. 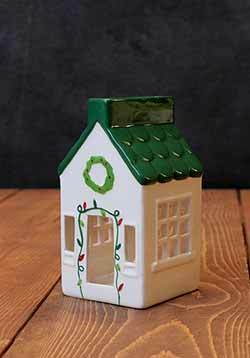 Darling ceramic house, with air vent in back so that it can hold a tealight! This is for the taller house, which as a green roof. Part of the Hope Peace & Joy Collection. 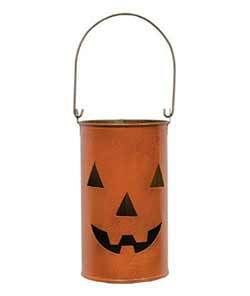 Set a spooky mood with this Jack o Lantern luminary, featuring a cutout grinning face just perfect for flickering candlelight! 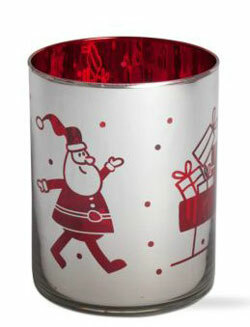 Shine some whimsy on your holiday with this glass hurricane! Features electroplated silver exterior with red Santa and reindeer design. 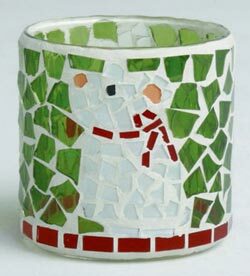 Mouse Mosaic Tealight, by Tag. Part of the Night Before Christmas Collection. Handmade painted glass pieces illuminate when lit; use with candles, as a vase or as home décor; tealights with clear or metal cup only. Measures 3 x 2.75 inches. 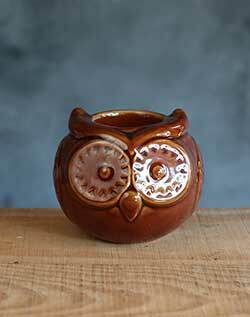 Oakley Owl Tealight Holder, by Tag. Stoneware with glazed finish. Fits a standard-sized tealight candle (not included). Measures 3 x 3.4 x 3.5 inches. 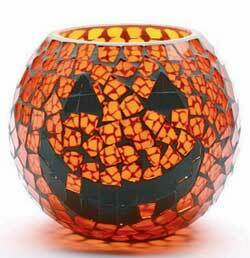 Pumpkin Mosaic Glass Hurricane, by Tag. Handmade glass mosaic hurricane with hand-painted glass pieces detailing a grinning Jack O'Lantern! Use as a candle holder, a small vase, or just a decorative accent! Glass illuminates beautifully in candlelight. Measures 6.25 x 6 inches. Part of Tag's 2013 Photo courtesy of Tag. 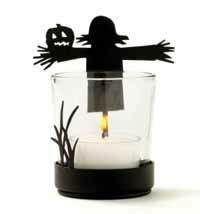 Scarecrow Votive Holder, by Tag. Handmade metal scarecrow silhouette with powder-coated finish, and clear glass votive cup. Measures 3.75 x 3.25 x 2.5 inches. Silver and White Votive Scape Set, by Nutcracker Designs. 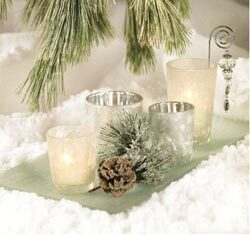 Glass votive scape set, including frosted glass plate, feathered glass cups, and pinecone decor. Plate measures 14.25 x 7.5, with 4 assorted cup sizes. 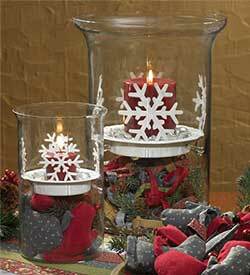 Snowflake Pillar Candle Pan, by Park Designs. Park's collection of glass hurricane cylinders and candle pan inserts offer a range of decor options, interchangeable for the seasons! Use the glass cylinder alone with a candle, or purchase one of the candle pans - it rests in the middle of the pan so you can burn a candle in it, and decorate the bottom with potpourri, buttons, rag balls, sand and shells, seasonal candy, and more! This is for the Snowflake Candle Pan, in the Votive size (on left in photo). This will fit universally in all three sizes of the VOTIVE glass cylinders. Measures 2.75 x 4 inches. (Larger size also available to fit the pillar sized glass cylinders). Large Star Plate or Candle Holder, by the Abbott Collection. This large glass star plate is great as a salad, bread or dessert plate or as a candle base. Coordinate with the rest of the ETOILE collection for a wonderful holiday centerpiece! Measures 8.5 inches. Candle not included. Two other sizes available! Small Star Plate or Candle Holder, by the Abbott Collection. 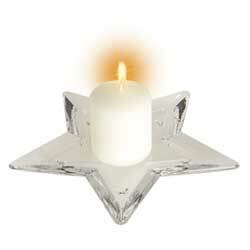 This small glass star plate is great for holding little knick-knacks or used as a candle base. Coordinate with the rest of our ETOILE collection for a wonderful holiday centerpiece! Measures 6.5 inches. Candle not included. Two other sizes available! This metal tealight holder is made of brown metal with a glossy finish, and is sized to fit a standard tealight candle (not included). Measures approx 3 x 2 inches. 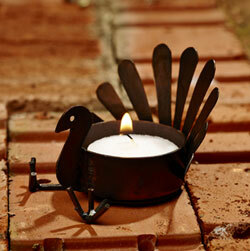 Set your dining or side table ready for Thanksgiving with this turkey-shaped taper candle holder, fashioned after vintage thanksgiving postcard images. 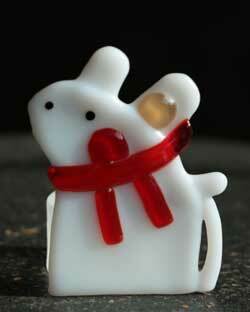 Whimsy Mouse Fused Glass Tealight, by Tag. Part of the Night Before Christmas Collection. Measures 3.25 x 2.25 inches. Fits a tealight candle (not included).